http://glenda-armand.com/events/2017-04-09/ http://schleifmaschinen-profis.net/welche-schleifmaschine-soll-es-sein/mini-bandschleifer/ WWhen you sit down for your preview session with Sarah, here are a few things to know and a list of what to bring. 1 – Bring inspiration pictures. Whether it’s a lip color from one photo and eyeshadow from another, bring what appeals to you. It is not to mimic that makeup necessarily, but to get a feel for the look. I find it helpful to see a picture of you in the look you’re most comfortable in! 2 – Be very direct and speak your mind. I want to make you feel confident and beautiful. As a professional, I understand that makeup can be subjective and I do not take critiques personally. My goal is to create a look you love. 3 – Bring your favorite makeup, like your favorite lipstick. This is so I can get an idea of colors you feel confident in. If there is a particular product like mascara or foundation that you’d like me to apply for you, I absolutely can. Keep in mind that I am a professional with a professional makeup kit containing high quality, long lasting products. I have worked with every skin tone and color. I promise I have the right color for you! 4 – Come with a clean face, if possible, for your preview session. Also, wear a light-colored shirt if you can. It will help you to be able to imagine your bridal look a little bit better. Veil or headpiece (if you have). Clip-in hair extensions if you would like to experiment. Any hair jewelry you may be considering. 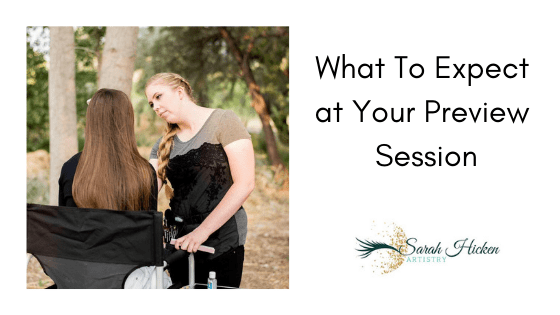 Send me a message to book your preview session to find your customized hair and makeup look! Such a great post! I never would have thought of any of those for a preview session.